You are just getting started, so have patience with yourself and the process and do not give up. Aeracura, as she is known in Iceland, is an angelic Mother Earth. Often pictured carrying a horn-of-plenty with fruits and vegetables cascading, she reminds us of the abundance and blessings all around us that are ours for the finding and harvesting. With arms opened wide to embrace all that comes her way, Aeracura not only blossoms but keeps blossoming, to her fullest potential. She welcomes the abundance that is hers – and all of ours – for the taking. Like Aeracura, our posture must be open-armed. Not only able to be open to whatever comes our way, but to welcome it – that’s the mindset that’s crucial to manifesting and recognizing the gifts that God, and the Universe’s Spring, brings our way. Spring, with all of its often trite symbolism, somehow manages to stir our souls each and every time She arrives. She is the Season of Promises Kept. The time when the guarantee that was made by Autumn comes to fruition. The world around us is reborn and, as a part of God’s Universe, so are we. Even if we’re dragged kicking and screaming into our new life, we arrive nonetheless. The energy of spring is strong stuff. This spring, why not capitalize on the rebirth momentum and allow that energy to carry you along, farther than you could ever have imagined. Allow yourself to bloom in all of your glory. Psychologist Erik Erikson presented the world with the theory of the stages of psychosocial development. Can that development be rushed? 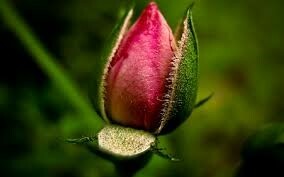 Erikson likened it to a blooming rose: You can force the bloom. 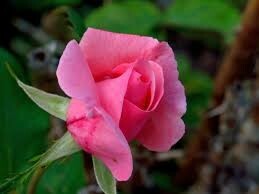 You can place the rose in a vase of hot water; you can roll the petals a bit between your fingers. Place the rose in a hot house and you’ll get an early bloom, true … but you’ll also never know what beauty that rose may have had if left to bloom in its own time. There is a time for every purpose under Heaven. As you consider your blooming, take some time to reflect on the nicks and scrapes that brought you to where you are. Consider the timing. Would you have been ready for this challenge, this success, these dreams-come-true at an earlier point in your life? If you can be truly honest with yourself, you’ll probably come to understand that This is the best time. This is the time when you are truly ready. Lessons have been learned. Dues paid. You’re ready. Lift your face to the sun. Tend your garden. Relocating last year, at almost precisely this time, we found our new home during a whirlwind tour of local real estate. Waiting for the agent to unlock the front door, I noticed a few little green sprouts in the mulched bed along the sidewalk. Seemed nice. Seemed harmless. Then May arrived. The once Seemed Nice area was now a jungle of daylilies and … things. Shrubs blooming on shrubs. Trees growing within trees. The backyard wasn’t much better. It was, for all intents and purposes, The Attack of the Irises. And more trees inside of trees. Plus vines. While standing there – surrounded by an arsenal of lawn tools – a neighbor stopped over to (gently) commiserate. He explained that the house was built by the owner of a large nursery. Then when sold to someone who had less than no interest in gardening, what was initially designed to be a glorious display had turned into a cluster of tangled plants. We all know the feeling: There are people and processes and now-habits in our lives that were never designed to be what they have become. Decisions that we made and the results that followed no longer serve the purposes they were intended to serve. Maybe you, too, find your life to be a jungle place. Crowded. Unable to appreciate and enjoy the people and experiences that you love because life has become so tangled. Spring is the perfect time to assess. He perfect time to prune. For every gardener, the lessons are often times hard won: Use hand tools. I had gone to the kitchen for a drink when I first heard the chainsaw engine. Before I could get to the yard, the branch was on the ground. A big, giant branch. We now had a (big, giant) view of the neighbor’s deck and they, ours. When one is editing, use hand-tools. Motor-less hand-tools. Sure, there are times when only a chainsaw will do it. But, for the most part, our lives are better trimmed as a Bonsai: With the tiniest of scissors wielding the tiniest of cuts. Grow where you’re planted. Life would be more exciting if I were in a big city. Life would be easier if I were in a small town. If only I were (fill in the blank). Look around. Some of the prettiest trees with the most interesting, twisting branches are so because they have made their way through and around immovable structures in their environment. 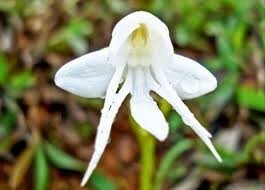 Some of the brightest flowers look even more glorious because their blooms peek through high, dull grass. Grow where you’re planted. It’s where you’re supposed to grow. Soak up the sun AND the rain. The sun brings warmth. It begins the photosynthesis process that allows for nourishment. Still, we all know what happens without rain. As children, we learn that April showers come our way to “bring the flowers that bloom in May.” Life’s challenges, life’s rainy days, nourish us in ways that we need. Ways that are critical to our growth. It’s no surprise that the heaviest, drenching rains are often in the springtime months. The months of growth. Dearest Aeracura, please come to me now. Please fill my heart with your great Divine love. Please clear my heart and mind of cares and worries. I ask that you bring your basket of bountiful gifts to me, and help me receive these gifts with love and gratitude. Help me tap in to my creativity and unleash my inner artist, to help express my love in a way that benefits the world. Please help me accept support for my artistic and creative projects. Excerpt from Prayer to Aeracura. When we receive Blossoming in a reading, it is direction to do just that. It is also a reminder to allow it. Flowers don’t bloom because they want to. They bloom because it’s what they do. Blooming is what we all do. What we are supposed to do. It’s our calling. Your seed was planted in the perfect place. God and His Universe planted you precisely where He knew you would have all of the nutrients you needed to grow into the perfect you. He sent His angels to tend to your garden, your life. When this card appears, it is a gentle touch of encouragement from your angels if you are struggling to thrive in rocky soil. You can do it!, they cheer. Keep going! Keep growing! Keep reaching! Don’t give up! This card’s appearance can be that of the soft angelic voice that whispers with confidence that the sun is coming to warm you or the rain is just a cloud away. That the dry, barren autumn of your life is passing. There’s a new season. A season of life. Enjoy your Spring … and may Summer find you in full bloom! 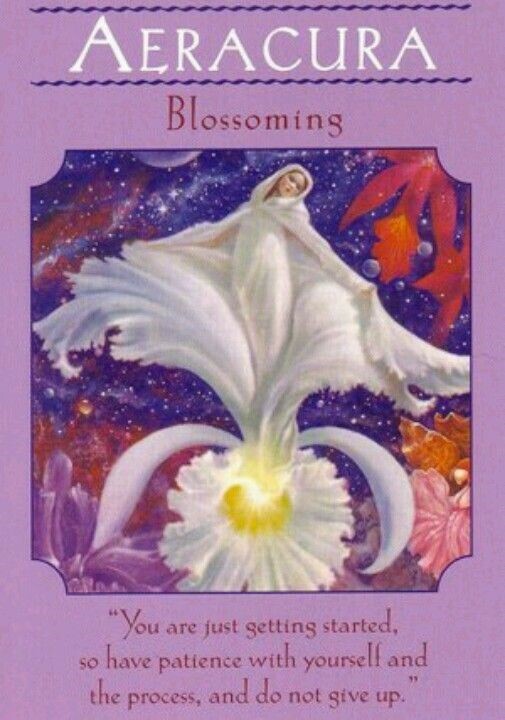 The Blossoming Angel Card is selected from Doreen Virtue’s Affirmations from your Angels deck.